I am often asked which are my favourite photos that I have taken over my years as a professional photographer. So I thought it would nice in 2019 to share some of the images I like the best. The plan is to do several series for the different genres of photography I cover. During the series I’m going to take one image that I love and talk about how it was created. One of my big passions in my work is photographing musicians. Before I became a professional photographer I worked as a musician myself. So I find it’s a wonderful mix of my present and former lives to take photos of amazing musicians all over London. One of my favourite ever images that I’ve taken of a musician is this one here of Miriam. It was taken a few years ago at the top of the amazing Royal Opera House in Covent Garden. Occasionally I go back and play in the Royal Opera House Orchestra, where I worked full time many years ago! Miriam and I were on the same ballet production together. I can’t quite remember what the ballet was but it was a Triple Bill. We weren’t in one of the ballets, so we used the free time we had to take some photos of Miriam. She was due to perform the Brahms Violin Concerto with an orchestra and needed to update her publicity photos. We started off her mini musicians photography session around the lovely streets of Covent Garden. Then as the sun was setting and the light was turning perfectly golden we made our way to the top of the Royal Opera House. 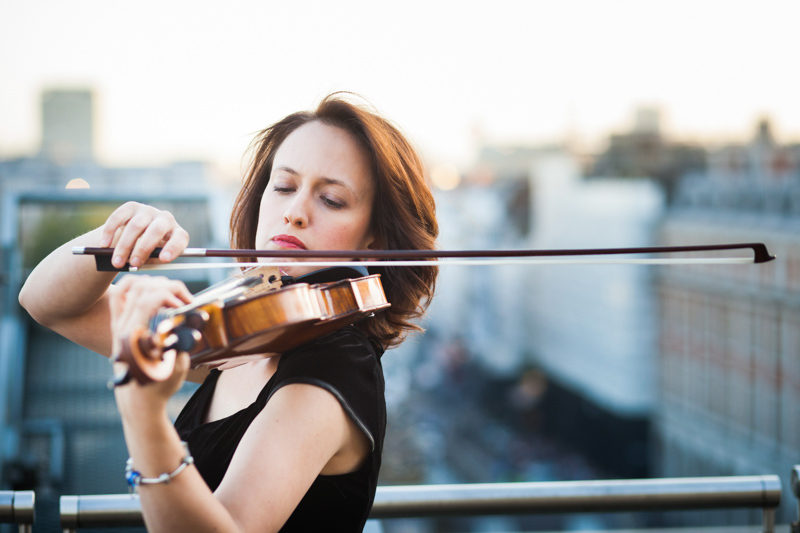 Miriam started to play her violin and we captured this beautiful musicians portrait . We then nipped downstairs into the pit to play the next ballet! I was so happy that Miriam was overjoyed with all the images but especially with this one. I think it’s actually the one she went on to use to publicise her upcoming concert. If you’re interested in booking a musicians photography session please do get in touch. The sessions are really fun and relaxed and take place on location. After the shoot you’ll have a varied series of images you can use for your website, social media and in concert programmes.